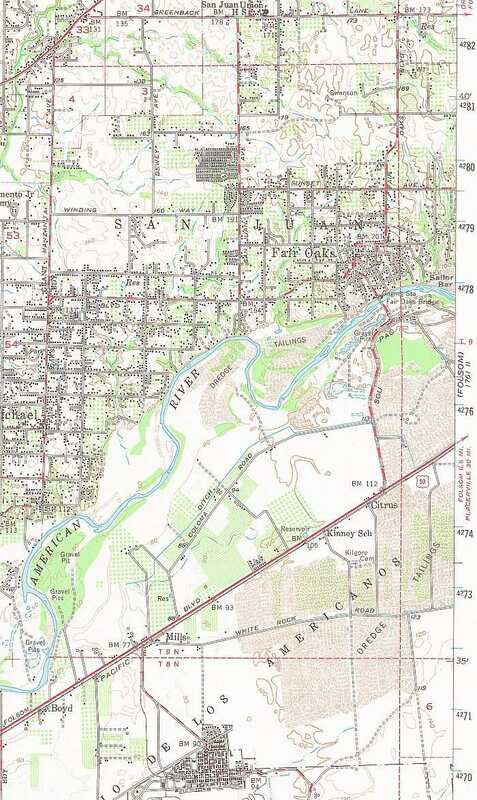 We haven't found any maps between the 1930 plot maps and this 1954 USGS map of Fair Oaks (surveyed in 1949). It's somewhat amazing that the USGS relied on the 1902 map for so long, but as far as we can tell, there was no resurvey between 1908 and 1949. The full, let's call it 1950, map is available at the USGS website. This map is pretty significant in its timing however. While Fair Oaks grew slowly from 1930 to 1950, major happenings started just after this map was made. Aerojet moved in, major housing was constructed in Rancho Cordova, and the original Sunrise Bridge was built. As you can see in this pre-Aerojet map, Fair Oaks, other than Old Town Fair Oaks, was still somewhat sparsely populated. Each small black square represents one building, so you can see how your neighborhood has developed since then. The Sunrise Bridge hadn't been built yet. It would span the river right at the vacant space above the "G" in Gravel. In the north-center part of the map is the first Fair Oaks housing development, known locally as the "Bird Tract", for its street names. Of course, there's no Highway 50, and none of the houses south of Sentinel on Earnscliff Ave. (including your Webmaster's home) had been built yet. And, it sure looks like a large chunk of Madison Avenue and some of our western Fair Oaks streets haven't been built completed either. We're sure all the newcomers will be fascinated by what your neighborhood looked like in 1950. Also unfortunate is that the USGS Folsom Quadrangle wasn't updated at the same time, so we can't show you the eastern parts of Fair Oaks. That's it for our first edition of "Historic Maps of Fair Oaks." Now that we have a general structure for this section of the website, we'll be looking around for more maps to fill in the gaps. As always, any suggestions are welcome. Return to the FOHS home page.